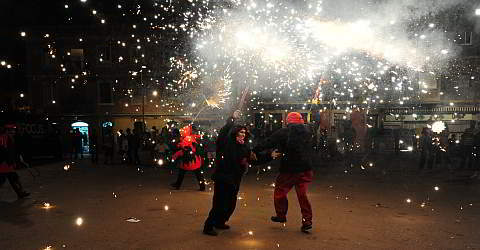 Sant Joan on 24 June, day of St. John, is for many people part of the most important holidays in Barcelona. Two special events are celebrated: St. John's birthday - the patron saint of Catalonia - and the summer solstice, which is the shortest night of the year and the calendric beginning of the summer. Objections - because the shortest night of the year is on the 20, 21 and 22 of June - do not make a difference, the St. John's Eve is celebrated on June 23 regardless. When is Sant Joan really? June 23 or 24? There's two dates that cause confusion: the 23 and 24 of June. The holiday, the non-working day, is on 24 of June, however people celebrate on the 23. It causes confusion sometimes, when everybody celebrates Sant Joan on the 23 but the actual holiday is on the 24th of June. It's really simple once you think about it though, people celebrate the St. John's Eve which means the night of the 23 to the 24 of June. The holiday itself is good for recovery. The date 24 of June was determined based on the St. Luke's Gospel: six months before Christmas and three months after the Annunciation Day. In the church year of the antique the date of the summer solstice resulted to the 22-24 of June. The reason for the reference to the summer solstice was the quote by John the Baptist "He must increase, I must decrease". However the modern astronomy was most likely not interested in it, when they determined the 20 to 22 of june to be the shortest nights of the year. This night is loud, really loud! Starting at the beginning of dusk there's fireworks throughout the whole night. That's how demons are supposed to be expelled. You can experience parties in various districts with a large culinary offering - people eat a lot in that night. There's always music and in some places, especially in Barceloneta you can find the fire-spitting Correfoc. The street parties are usually organised by associations and groups from the districts of the city. That's why their character is quite familiar, even though it usually is crowded. Musicians and DJs take over the stages after the celebrations took place. Probably the most parties take place within the Old Town district and the district Barceloneta right at the beach. A night without a visit of the city beach would not be the same. You just have to go there! Even on the hottest days of the peak season the beach isn't as full as it is on Sant Joan. You can dance at every beach bar in Barcelona! Don't be surprised, there's no big fireworks at 12am, the fireworks are all night long. At 6am, the city cleaning takes over the beach and streets of Barcelona: the beach is getting cleaned with a big equipment and many employees of the city cleaning sweep the paths. Barcelona is way different on the day of San Juan: an almost eerie silence dominates the streets, even in the usually loud district Eixample. Every now and then a few people and cars disrupt the silence. Many bars are closed, stores except for a few grocery stores too. You can barely see any taxis in the morning of 24 of June. Usually you can see them everywhere. Only in the early afternoon the city is revived and you can recognise Barcelona.